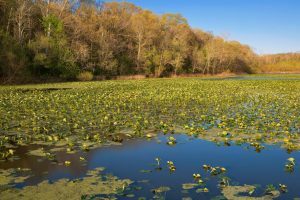 Hikers, naturalists, bird-watchers, and hunters can all enjoy the 300 acres of preserved woods, fields, and wetlands that is the McKee-Beshers Wildlife Management Area. McKee-Beshers is known for its deliberately flooded forests during the fall and winter. Biologists create these “greentree reservoirs” to attract colorful wood ducks and other waterfowl that migrate through or spend the winters here. Along the preserve’s many miles of trails, you can also spy more than 200 species of songbirds and other wildlife such as deer, wild turkey, reptiles and amphibians. Photo buffs have an extra reason to plan a visit to McKee Beshers. Fields of giant sunflowers planted by hunters to lure doves to the area create spectacular displays of color in early to midJune.